These are a couple of pix from the festival. I'll try to finish this post by the end of this month (hopefully). It’s raining…pouring. It’s the kind of weather that makes you want to stay at home all day when bicycle is the only transportation you have. And that’s what I’m going to do. I’ll spend all my time with my laptop until I leave for work at around 5:30 pm this evening. Well, my laptop broke last Saturday and it will take at least two weeks to have it fixed. Two weeks without internet access? No way. So now I’m using the one that I've been keeping as a back-up machine. It is working fine, at least, but all those bookmarks I made on the other laptop…!! I don’t even want to think about re-doing all of them on this laptop. 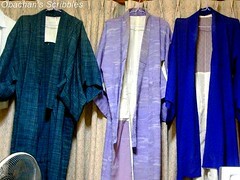 These are a few of the kimono costumes used for a musical this spring. In the beginning of the season I did some stitching/taping work on them and attached hooks here and there to make quick changes easier and to prevent them from getting loose while dancing. In addition, I made a pre-tied obi (special tie for Japanese kimono) from a regular obi the musical group bought at a used kimono shop. Looks like I always feel the urge to start or re-start something at this time of the year, every year. 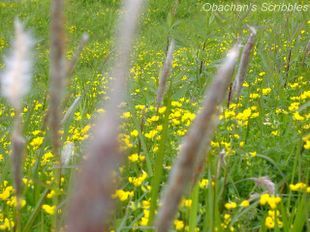 It’s no surprise, because the climate is nice -- not too cold, not too hot--, trees and grasses are in fresh green, and I’m usually feeling better after the cedar pollen allergy is gone. So what kind of urge am I feeling this year? Well, the other day, I re-started my habit of going walking about twice a week. Also I'm planning to spend some time painting a watercolor this weekend. You know it’s such a shame… I have a couple of hobbies that should make myself feel better when I’m too stressed or feeling weak, but I usually don’t feel like doing any of them when I am actually stressed or feeling weak. Anyway, another thing I started recently is something I’ve always wanted to do: it’s learning about Buddhism and especially, the Hannya Shingyo (the Heart Sutra). Strange, ha? 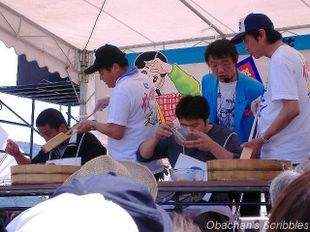 Or you think obachan is really getting older and obachan-like? (That’s the image the majority of people have here in Japan. They think Buddhism and sutra are for elders only.) Well, I AM getting older, like everyone else, but I don’t think my interest in the sutra is so much based on the worries about my health or my future. Well, it was just like that. I went to see the Koinobori festival last Thursday, which was a little chilly and windy day, and I was still coughing quite a bit last Friday. Then Saturday… I was still feeling kind of weak, but did not cough much in the daytime. And yesterday, my mind was so occupied with a couple of things almost all day that I totally forgot about my bronchitis (and forgot about taking medicine, too). In the evening I did a little stretching and even tried a little walking by the river, just because I felt like it. When I went to bed after midnight, I realized that I didn’t cough AT ALL that day! Usually people in the food-service industry cannot take many days off during Golden Week; it is the busy time of the year for them, if not the busiest. Of course I had to work at the kaiseki place every night from May 1st to 5th, and I had bronchitis. So my Golden Week this year was almost going to be a totally eventless one. But when I accidentally found out about an event in a town called Ino-cho, which is not too far from where I live, I thought it wouldn’t hurt to go take a quick look. Whenever this kind of idea comes to my mind, I just can’t stop. I packed my lunch (lemon chicken, avocado-tomato sandwiches and boiled potatoes) in a great hurry and spent all afternoon by the Niyodo river. 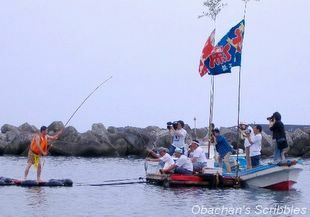 It was a 3-day event held to celebrate the Children’s Day, and carp-shaped streamers called koinobori were the center of attraction. 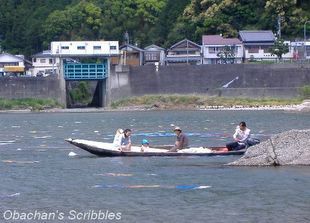 As I wrote in my previous post, Ino is famous for the production of washi (Japanese traditional paper). 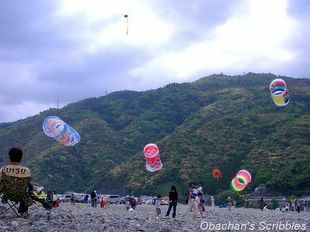 So you can imagine the koinobori used in the event were not regular nylon ones but had something to do with their local specialty. 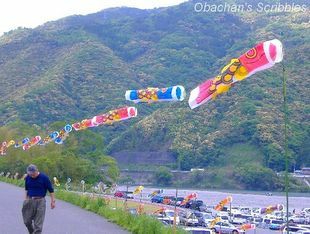 Yes, those koinobori streamers were made out of paper, and instead of floating in the wind, they were swimming in the river! 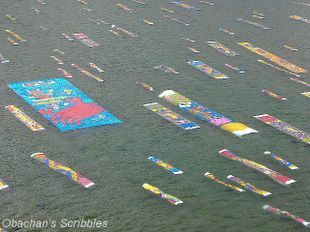 How come the paper streamers can stay OK in the river for 3 days? Actually they were made of what we call “Fushokufu 不織布 (unwoven fabric? )” which is supposed to be very strong and water-resistant. These koinobori on the roadside were also made of the same unwoven fabric, and each of them had a photo of a baby printed on it. 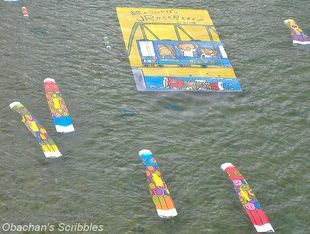 I guess it was a part of the event and local moms paid some money to have their baby’s photos printed on the koinobori. 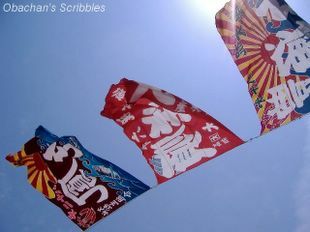 These koinobori in the air looked like nyron ones. Very cute and colorful. 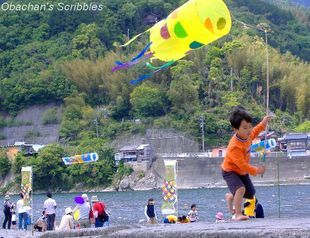 Some kids borrowed koinobori and had fun flying them. Others were having a good time in the river. Some people went very close to the streamers in the river by boat. 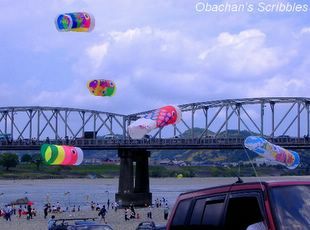 According to a Japanese article about this event, this is how the koinobori streamers were made: They first did the drawing and coloring (with water-based paints) on flat, rectangle pieces of unwoven cloth, then rolled each piece into a cylinder. To join the edges, no glue was used -- they were ironed together. 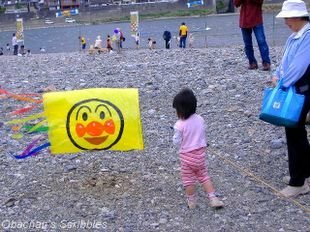 To me, the idea of “paper koinobori swimming in the river” is interesting, and more than a hundred colorful streamers in clean river water were worth watching. 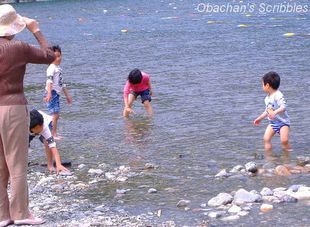 And kids’ laughter in beautiful countryside scenery! Something always nice to see anywhere in the world. But I just thought it was probably better to take a train to Ino station and walk from there. My friend and I had to stay in the car for a while in a waiting line to get into the venue, and to get out, we needed to take a very small path to go a long way round, which was kind of fun, though. Flowers near the parking space. So, at least, I did something to post about in Golden Week this year and I'm happy about that. The doctor was a young man who was, according to one of my colleagues, a cute guy. Yes, the colleague was the one who recommended the hospital and the doctor to me, saying “Oh you should see him. He’s cute.” Well, I guess there’s a little difference between her definition of “a cute guy” and mine, but anyway, he was nice and seemed to be a good doctor. BTW, the weather is so strange here now. It was so hot today in the morning, and now it's totally cloudy and wind is roaring outside --- no rain, just the wind. It might start raining soon, or I wouldn’t be surprised if it’d start hailing. It just looks too strange. And whatever would come, I’ll have to ride my bicycle to work tonight. Rest? The Dr. told me to rest well? OK, Doc, I’ll try… when I can.